Rhinestone Bedazzled Miniature Tailcoat Set. Rhinestone-encrusted three-piece tailcoat set. Set consists of tailcoat, jumpsuit which zips up back, faux vest that buttons onto the waist of the jumpsuit, detachable jabot, paper collar, and bowtie. Cream colored swirling jacquard fabric is further embellished with all-over rhinestones, including completely encrusted shawl collar and tuxedo stripes on the pants. A show-stopping piece, could fit a child or petite woman. 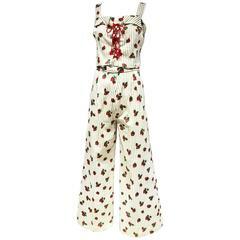 1970s Jungle Print Rayon Jumpsuit. Front button-up. Matching belt included. Elasticated waist. 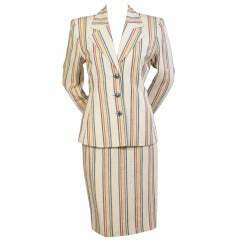 1960s Ivory Silk Jacquard Sheath Dress & Jacket Set. Silk satin dress, cropped jacket, and matching belt with floral design.